KATHMANDU, Dec 15: Laxman Parajuli, a vegetable farmer of Mandan-Deupur Municipality of Kavre sends his produce, mostly tomatoes, to Kalimati market every alternate day. But he does not how much his produce fetches as traders themselves fix the price. When Parajuli called the trader over phone the next day, he found out his tomatoes will fetch him Rs 1,400 to Rs 1,500 per crate (25 kg). Ramesh Chhatkuli, a farmer from Charaudi of Dhading, also said that they do not know how much his vegetables fetch when it reaches market. “But I have no choice but to accept whatever price they offer,” he said. Cauliflowers received a maximum of Rs 70 per kg for cauliflower over the past month. “But the same product was sold for as high as Rs 150 per kg in Pokhara and Rs 100 per kg in Kathmandu,” he added. Earlier, local cooperatives of farmers used to put the vegetable price of the market on their notice board. “Now, they have stopped displaying prices without giving any reason. This has left us helpless,” he said, adding that many farmers like him cannot take their produce to market directly. Not only farmers, vegetable prices keep even retailers confused. 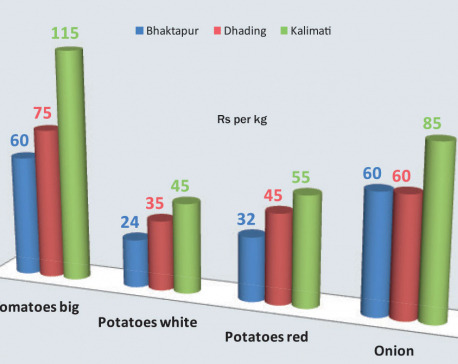 Koteshwar-based retailer Niraj Budhathoki, who sources vegetables from Kalimati and Baneshwar vegetable markets, says he always wonders why the price of tomato keeps fluctuating so much. “I purchased tomato at Rs 1,500 per crate on Tuesday. It increased to Rs 1,750 per crate overnight,” he added. 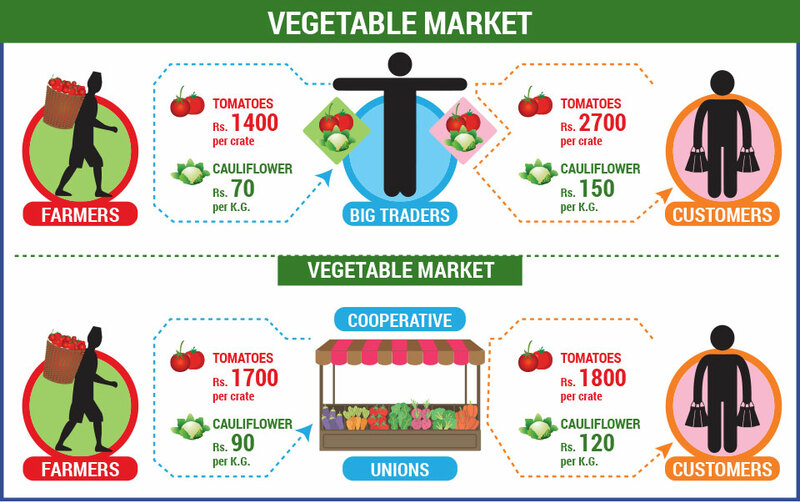 Some say farmers' cooperatives can play a significant role in ensuring that farmers get the best price for their produce. But cooperative leaders say that they have little say in the market which is ruled by a carter of traders. There are cooperatives in most of the pocket areas for vegetable production. But they have not been given equal space in all vegetable markets to sell their produce directly to retailers. Cooperative leaders say big traders control the price of vegetables in the market. “We do not get buyers because of their cartel. This leaves us with no option but to sell our produce to those traders,” the leaders said. Hemanath Thapaliya, chairman of Fruits and Vegetables Cooperatives Union, said many such cooperatives had a stall at the Kalimati vegetable market in the past. “But as our selling capacity is limited, many cooperatives have surrendered their stalls to other wholesalers,” he added. “About a decade ago, we were selling farm produce to retailers directly. But big traders in Kalimati influenced retailers and they stopped buying from us,” lamented Thapaliya. Thapaliya demanded the government allocate sizable space for cooperatives in all vegetable markets through which farmers can sell their produce at minimal costs. “This will not only help farmers get a better price for their products but also helps in price stabilization,” he added. However, Kalimati-based wholesaler Ramesh Rijal denies the existence of any cartel in the Kalimati market. “Vegetable price depends on demand and supply situation in the market. Prices plummet in the flush season, and rise in the lean season,” he said, attributing the recent hike in tomato prices to drop in import from India due to low production there. 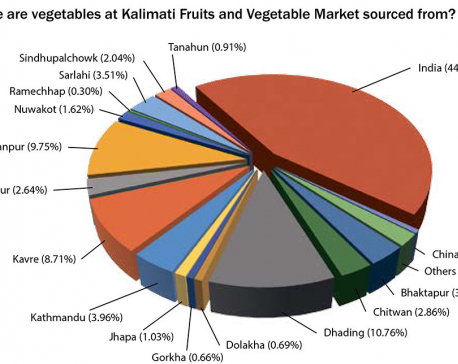 Binaya Shrestha, information officer of Kalimati Fruits and Vegetable Market Development, echoed Rijal, claiming that vegetable prices are based on demand-supply situation in the market.